Synopsis: (from IMDb) What if … you let a stranger into your house to use your phone, but while you’ve been patiently waiting in the kitchen, he just disappears … or does he? My Quick Review: What a weird movie. 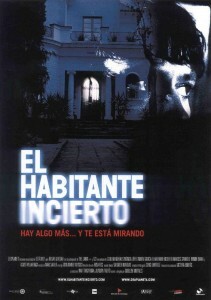 The uninvited Guest can’t really be classified as a “horror movie” in the traditional sense of the term. With that being said, the nightmarish state in which the main character spends the whole movie, and the very dark ending could justify it. The uninvited Guest is a minimalist movie that takes full advantage of its settings and is brilliantly directed by Guillem Morales. Thanks to smart editing and voyeuristic shots, the young spanish director manages to put us into Felix’s shoes while he is slowly losing his mind. Our hero is a very flawed man and, at times, it’s even difficult to root for him. After all he is very weak, child-like and can’t manage to face his fears/demons straight ahead. Because of those flaws, there can’t be a happy ending for him. Click Here to Own and Watch The Uninvited Guest Now!